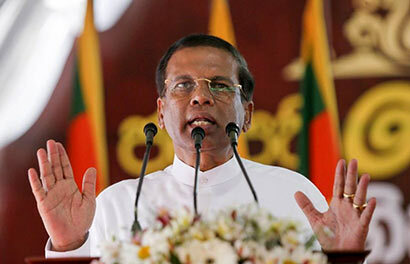 President Maithripala Sirisena expressed his dismay at the delay in taking legal action against those who embezzled public money. Speaking at a rally held in Aralaganwila yesterday, he added that he will use his powers and appoint a special presidential commission to investigate alleged corruption. He added that, as promised during the election campaign, he will take legal action against those who embezzled money from the people. The President added that the people in the country are waiting to punish the corrupt and that swift action should be taken against such individuals. Already MS is in dismay and wondering. This is what happens when you keep pointing the finger at others to often without getting the facts straight. I was wondering the same but how can the President make a statement that he is wondering. If he does not know what is happening then who knows.